The Finnish Brotherhood annually hosts a traditional Salmon Dinner, celebrating their rich heritage. This year they will once again gather on September 10, 2016 in the Uniontown Historic District of Astoria, Oregon. If you stroll through the Uniontown neighborhood of Astoria, you’ll see the proud legacy of the many Finnish immigrants who swelled Oregon’s population in the late 1800’s and early 1900’s. In fact, so many Finnish families arrived over a century ago that they became the largest group of immigrants in the city, and Astoria sometimes was called the “Helsinki of the West”. 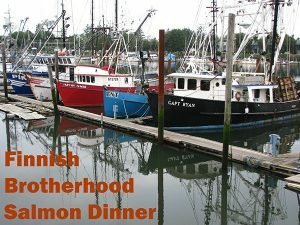 The United Finnish Kaleva Brotherhood & Sisterhood, formed in 1887, still boasts over 200 members and sponsors the Heritage Salmon Dinner, Saturday, September 10, 2016.. The Dinner, together with the Finnish Heritage Exhibit, honor the Finns’ expertise in commercial and sport fishing in the lower Columbia River. For the Exhibit, local descendants share family pictures and possessions that illustrate the ideals and traditions of these early Finnish settlers. Almost all of them were fisherman or worked in the fish packing plants. Make plans to dine September 10, when the salmon will be served fresh off the boat at Suomi Hall in historic Uniontown. (Suomi is the word for Finland or the Finnish language). Only 100 tickets will be sold, so make your plans now for the Dinner and your stay at Clementine’s Bed and Breakfast. Suomi Hall, near the waterfront, is a pleasant walk or just a five minute drive from the inn. What better way to welcome fall than with dining on Oregon’s famous salmon, learning about Finnish-American culture, and enjoying a relaxing weekend getaway in Astoria? This entry was posted on Thursday, September 1st, 2016 at 10:24 am and is filed under Clementine's Bed & Breakfast News, Events. You can follow any responses to this entry through the RSS 2.0 feed. Both comments and pings are currently closed.